I impressed quite a few of my guests, including my mother-in-law and my mom with this dish. Though it looks quite sophisticated, you can easily deceive your guests because this is actually very easy to make; all you need to do is to slice the ingredients individually and then arrange them as neatly as you can. This makes a great party dish because you can prepare everything in advance and serve it chilled from a refrigerator and it looks great. I have to make one disclosure here. 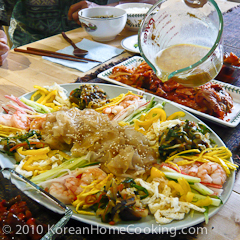 This recipe deviates from the original yangjangpi recipe in that the noodles (seen in the middle of dish) are not mung beans noodles, but instead I used Vietnamese rice papers because they are easier to find in a supermarket. It turns out I like it beter with rice papers because they give more chewier texture. 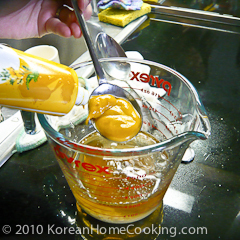 Make the mustard sauce by mixing all the ingredients together [Ingredients List A]. 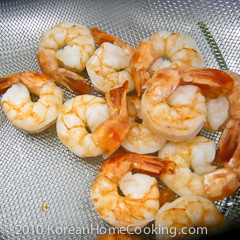 Boil shrimps, drain and slice in half. 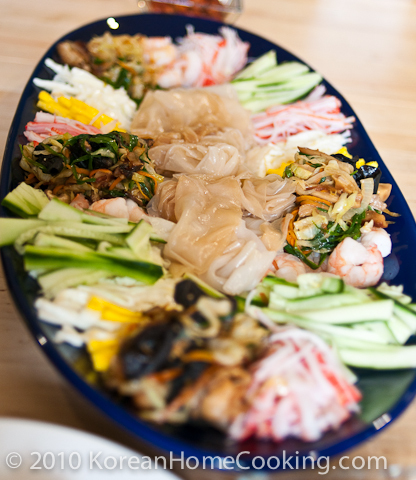 Julienne fresh vegetables, faked crab meats, etc [Ingredients List C]. You may choose different vegetables to fit your taste, but try to pick different colors of vegetables. 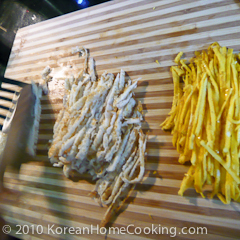 Make egg threads by frying the egg yolks and whites separately. 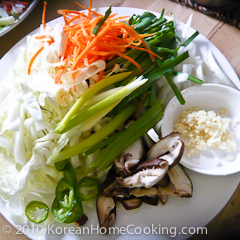 Prepare the vegetables [Ingredients List B] for stir-fry. 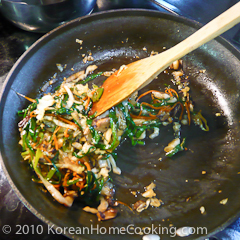 Stir fry the vegetables in Step 5 with a little bit of soy sauce, sesame oil, and cooking wine. 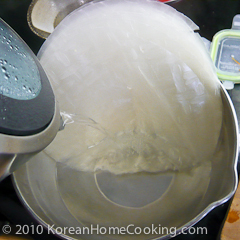 Soak Vietnamese rice paper in hot water for 30 seconds and drain. 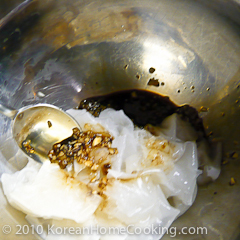 Season the rice paper in the sauce from Step 8. 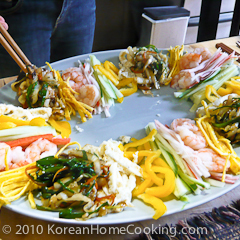 Arrange the prepared vegetables and seafood around a plate. Alternate different colors. 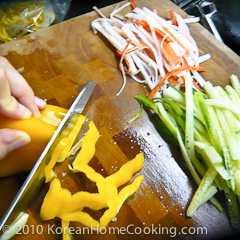 Place the seasoned noodles from Step 9 in the middle of the plate. 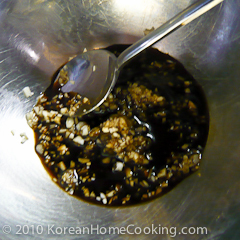 Pour the sauce over right before serving. Outstanding inspiring article. buy followers instagram I am actually enjoy establishing your post because its very unique selective information for me. Thanks a lot for sharing this magnificent post.